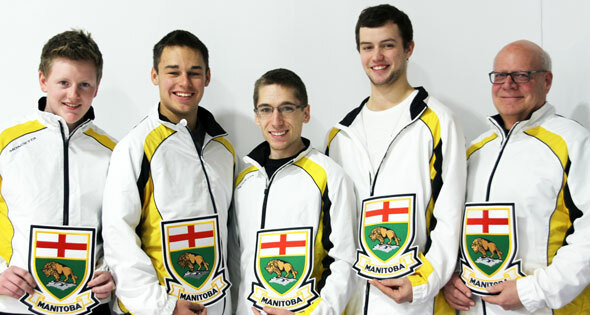 Braden Calvert and his Manitoba champs are still undefeated at the Canadian Junior Curling Championship. - Carberry's Braden Calvert remained undefeated at the Canadian Junior Men's Curling Championship Monday night, defeating Stephen Trickett of Newfoundland and Labrador 10-5. Calvert and his Deer Lodge team are 5-and-0 and in sole possession of first-place in Pool A, one game ahead of 4-and-1 Ontario. They'll conclude their preliminary round-robin against Ontario Tuesday morning. The foursome has already qualified for the next stage of the competition. - Richard Daneault claimed the Manitoba Open bonspiel, formerly the MCA Bonspiel. Daneault defeated Sean Grassie 6-3 in the Asham Event Final Monday to earn the bonspiel title and a berth into the Safeway Championship. Mark Lukowich and Don Nelson earned two of the other berths into the Provincial Men's Curling Championship while the fourth and final berth is being decided in a tiebreaker. Trevor Loreth plays Kevin Brown for the final spot Tuesday night. - Former Brandon Wheat Kings Michael Ferland is going to miss the rest of the season. Ferland underwent surgery on his knee this week after originally being injured on December 12th. Ferland had six goals and 18 points in 25 games with the AHL's Abbotsford Heat this season. - Former Wheat Kings' captain Mark Stone won't be traveling with the Ottawa Senators this week. Stone is believed to have suffered a shoulder injury in practice Monday. Stone was called up from Binghamton on New Year's Day, Stone has been playing on a line with Jason Spezza and Colin Greening. Stone has one goal and two points in seven games with the Sens this season. - Former Brandon Wheat Kings' head coach Dwayne Gylywoychuk has landed an international assignment. Gylywoychuk will be an assistant coach with the Canadian team for the World Under-18 Women's Hockey Championship. Aside from that role, Gylywoychuk remains out of the game but is keeping his options open and is confident a new position will fall into place. Gylywoychuk guested on CKLQ's Monday Sports Talk this week. - Derrick Pouliot of the Portland Winterhawks is the Western Hockey League Player of the Week. Pouliot had one goal and four assists for five points in two games last week while also recording a +5 rating. - The Manitoba Junior Hockey League Player of the Week is goaltender Scott Parsons of the Winnipeg Blues. Parsons had a 1.19 goals against average and .943 save percentage in three appearances last week. - The Saskatchewan government is taking a hit of about 668-thousand dollars on the Memorial Cup junior hockey championship held in Saskatoon last May. The province has just approved payment to the Canadian Hockey League because the event didn't meet a profit guarantee of 3.5 million dollars that was made when Saskatoon bid for the championship. - It wasn't a question of if, just how much. The NHL has suspended Vancouver coach John Tortorella without pay for 15 days for his conduct after a brawl between the Canucks and the Calgary Flames. He'll miss six games in that span after trying to charge into the Flames' locker-room during the first intermission of Vancouver's 3-2 shootout win. Tortorella is also expected to forfeit about 50-thousand dollars in salary. Calgary head coach Bob Hartley was fined 25-thousand dollars. - Evander Kane will return to the Jets' lineup Tuesday night when Winnipeg opens a West Coast road trip in Anaheim. Kane has missed the last four games with a hand injury suffered in a fight on January 7th. The Jets have won three in a row since Paul Maurice took over behind the Winnipeg bench. Despite the winning streak, the Jets remain ten points out of a playoff spot. - The CFL may be on the verge of a new era. Montreal Alouettes' quarterback Anthony Calvillo is widely expected to announce his retirement at a press conference Tuesday. Calvillo has spent the last 20 years in the league and is professional football's all-time leader in both yards and touchdowns. However, problems from an August concussion prevented him from playing during the last half of the 2013 campaign, and that's likely led to his decision to retire. - Eugenie Bouchard is entering rarified air for a Canadian. The 19-year-old from Montreal is the first Canadian to reach a Grand Slam semifinal in 30 years after upsetting Ana Ivanovic at the Australian Open. She will play China's Li Na in the semis.